During the big Thanksgiving sale on PSN last month, I finally downloaded ThatGameCompany's Flower for a scant $4.99. I'm really glad that I did. 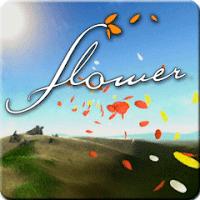 Flower is a very simple game: you control the wind, and your goal is to collect flower petals. That's it. In fact, in spite of any game-like characteristics that it might possess, I would hesitate to refer to Flower as a game, but rather a directed interactive artistic experience. I know that such a statement marks me as a participant in the "games as art" discussion, which forum users seem to take somewhat personally. My opinion is that if a developer is attempting to impact the emotions of someone who is partaking of their game, they are generally attempting to do so through artistic expression. Though, I imagine that this can be a problematic goal in that it is almost always attempted independently of the rest of the game, which is usually approached in a more conventional fashion. For example, Hideo Kojima may have presented an expression of the hideousness of war in the feature-length cut scenes in Metal Gear Solid 4, but he did so completely independently of the rest of the game, which most people experienced by killing hundreds of enemy soldiers. In order for the mechanics of the game to be in alignment with its "artistic elements" it would have had to disincentivize the killing of enemies, which would likely have had disastrous consequences on its retail presence. Downloadable titles don't need to sell millions of copies to be considered financially viable, and their developers can be unashamedly artistic in their approach to the design of a "game". But perhaps I am digressing from the subject at hand. I found Flower to be very relaxing and often surreal to play. At several points during the game, it ellicted emotions in me in a way that I did not expect. Of course, attempting to write about the emotional experience in any detail would trivialize the whole matter: trust me... I tried to write about it in an earlier draft, and it just seemed silly. Suffice to say that Flower is a must-play.